The Cornfield Project is really starting to blossom – with more flowers put in place this week ahead of a summer of colour for the Millburn and Ballysally estates. On Monday over 400 wildflower plug plants were put in place by children from Ballysally Nursery, while adults involved with Base Coleraine helped prepare more of the woodland for planting. 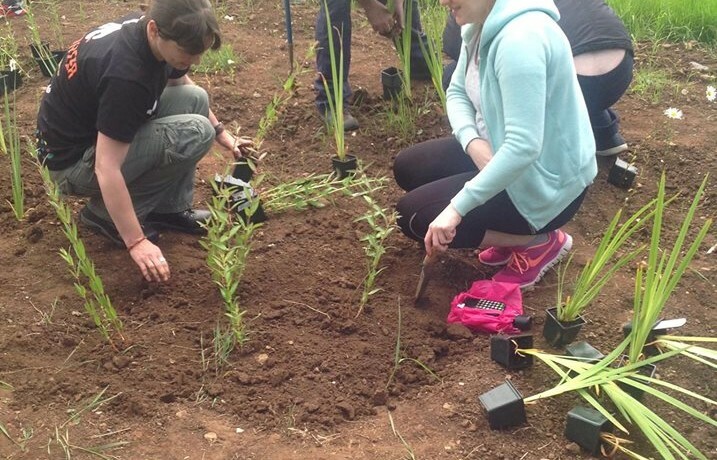 The event was hosted by Grow Wild and The Conservation Volunteers to bring new groups of volunteers from Coleraine to the area. The Ballysally Nursery pupils had grown their own wildflowers from seed planted earlier in the spring – and these were brought along and planted by the children with help from their parents. The children, parents and staff of the nursery were very proud of their little plants and will enjoy coming back to see them grow into beautiful wildflowers. Base Coleraine, a group of active adults with learning disabilities, brought an energy and warmth to the site – as well as doing loads of valuable work – by planting and weeding much of the area. They hope to be able to have regular activities at The Cornfield Project for both their staff and clients to become involved. The planted wildflowers will add more colour to the areas sown earlier in the spring and will ultimately be part of stunning wildflower meadows to brighten the whole of Coleraine.